This is one of the 12 projects we did during our Stamp Camp in April. I'll be posting a selection of what we did during our first Stamp Camp over the next several days. I'm currently taking signups for the May Stamp Camp! 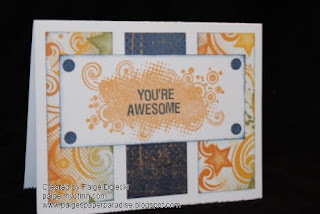 What: STAMP CAMP - unlimited all-you-can-create card and gift making event! Cost: $15 for the first 2 hours (7-9PM) and $5 for (9-10PM) if you are in the creative groove and just can't stop! RSVP: Yep! Limited is limited to 10 spots per session.